Hamilton: The Revolution by Lin-Manuel Miranda and Jeremy McCarter – A few months ago, I honestly wasn’t into the whole Hamilton thing. I tried to listen to the soundtrack and just couldn’t get into it. Once I heard it was coming to Buffalo, my mind changed. I knew it was something I didn’t want to miss out on, so I managed to snag tickets for my husband and I – despite still having never listened to the soundtrack. Once I finally did, I understood the hype. I finally got to see the musical earlier this year, and read this book beforehand. It was a thick book, with a lot of great photos & stories behind the creation of the musical, as well as the actual history behind the story, and I’m glad I read it before seeing the musical. It helped me grasp the backstory a bit more as well as catch some of the quirks that I might’ve otherwise missed out on. Brave Enough by Cheryl Strayed – A quick little read filled with quotes and anecdotes. It was just the pick-me-up I needed at the time I read it. If you haven’t read Strayed’s book Wild yet, do that first. Fear: Trump in the White House by Bob Woodward – I’d be lying if I said I wasn’t incredibly frustrated by the political climate in the United States right now. This book was an an intense, thorough, deeply-researched and well-written look at the presidency, how we got here, and how the hell we’re going to get out alive. If you don’t respect Woodward as a journalist & author, you’ve got some explaining to do. Girl, Wash Your Face: Stop Believing the Lies About Who You Are So You Can Become Who You Were Meant to Be by Rachel Hollis – I’m honestly somewhat torn about this book. It was a good read and you can definitely take inspiration away from it! However, I think it’s important to also recognize Rachel’s privilege and how that comes across in the book. That being said, I’m looking forward to her next book in 2019 and recommend you keep an open mind and read this book first. Broad Band: The Untold Story of the Women who Made the Internet by Claire L. Evans – This was a great story about a history that I had *no* idea existed! Check out my review of this book here. Soulful Simplicity: How Living with Less Can Lead to So Much More by Courtney Carver – I’ve made a few attempts this year to drill down to the basics and focus more on what matters – whether that be people, emotions, or material things – rather than what doesn’t. Living simply, ripping away all that excess that holds you back, is a good principle, I think, and something I’d like to focus more on going forward. #NeverAgain: A New Generation Draws the Line by David & Lauren Hogg – America has a gun violence problem. This book was a quick read but so, so important and critical in our current political climate. Children should not have to fear going to school. We should not have to fear going to work, to the grocery store, to the mall, or wherever. If you’re as frustrated as I am, read this book by two young people who are working to make this country better and fix some of its worst problems. This is Me: Loving the Person You Are Today by Chrissy Metz – I’ve enjoyed watching Chrissy in This Is Us and I appreciate the play on the TV show’s title in the title of her book. That aside, this was a good book about confidence, self-love and learning and growing with yourself. The Crown: The Official Companion, Volume 1: Elizabeth II, Winston Churchill, and the Making of A Young Queen (1947-1955) by Robert Lacey – I’ve been loving watching Netflix’s The Crown and was happy to dive into this book, which was a lengthy read with a lot of historical details. It was neat to see where the plotlines in the TV show vary from what actually happened historically, and to learn more about what was happening during that era. 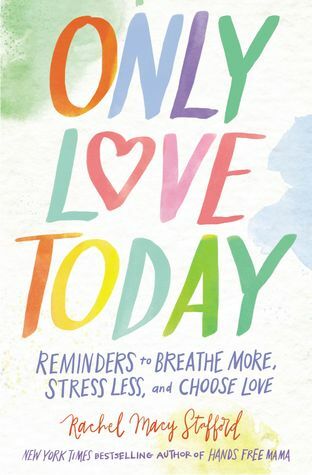 Only Love Today: Reminders to Breathe More, Stress Less, and Choose Love by Rachel Macy Stafford – I’m going to call this book perhaps the most important one I read this year. It was just what I needed when I read it early in the year, just a few short weeks after my dad passed away. Maybe I’ll read it every few years just to give myself the reminders to breathe more, stress less and choose love. Alright — what was your favorite book you read in 2018? What books are you looking forward to reading in 2019?